Learning How to Dance in the Rain ....: Its raining - its pouring!!! Its raining - its pouring!!! Okay so I was going to write this earlier but we have had a bit of excitement since then!! Earlier this evening we took our youngest daughter to the drs as she had burnt herself quite badly over a large area on her chest! I had put some green beans in a microwave steamer and while I was outside - the microwave beeped and Miss C thought she would take the steamer out of the microwave . Needless to say it was extremely hot and she lost her grip and steam and boiling water flowed down her chest! Unfortunately she was just in a little tank top which offered no protection over her skin! My mum called me in to find Miss C - skin already lifted off in an area and redness all over. I turned on the shower to cold and placed her under in attempt to cool her skin and then we wrapped an extralarge iceblock in a pillowslip to hold on as we went to the surgery. She was crying in pain but in such a controlled way - I was amazed - having burnt my finger on steam in the past I know how painful that was - so could only imagine how excrutiating a large chest area burn must be!! Our Drs rooms are open to 7pm so thankfully we avoided going to the hospital emergency. They took us into the rooms straight away and in no time the Dr on duty was there to see us! Poor Miss C was in a lot of pain - he said the nurse needed to keep area cooled with sterile water so IV bags were opened and emptied onto C and then onto sterile towels which were laid across her chest and the nurse kept them moist by emptying the IV bags onto them. She was so incredibly brave - not once did she scream or shout - just kept saying how much it was burning when they stopped pouring on the water! They kept it going over about half an hour in an attempt to cool the skin - it worked very well and I think we went through a number of litres . C was lying on towels - soon the water was flowing through the bed and forming a large puddle on the floor! I was feeling a bit light headed in all of this so had to ask for a chair to sit down. Still battling after effects of the chemo so all fun and games!! Well once the skin was cooled enough - the wounds were dressed with what described as cupcake icing!! Dressings were secured and we were good to go. The Dr ordered some stronger pain meds and we are to return tomorrow for a check and redress. The nurses and Drs were so lovely and kind - so we were well looked after!! So back home we went - the girls had been wanting to watch the start of the new season of the Xfactor. It had already started by the time we got home - but we got Miss c settled comfortably on the chaise and she managed a bit of dinner and then after watching a bit of the singing it was into bed! I have given her some more pain killers so hopefully she will manage to sleep through the night!! Thankfully my mum is still here so Miss A was able to stay at home with her and Miss C is in bed next to Nanny tonight!! Honestly what a day - just when you feel your reserves are on empty - something else happens to stretch you even more. I had already been feeling a bit weary today - somedays you just don't want to think about breast cancer treatments , side effects etc. Somedays you don't want to look in the mirror and see a bald headed person looking back at you, somedays you just want to walk in the shops without a headcovering , somedays you just want get dressed without having to have to think carefully as you choose you clothes !!! And then when you are tired of being tired something happens to show you that somewhere inside there is still strength to forge ahead!! Yesterday we heard a wonderful preach about holding on in times of struggle - the words were so relevant to our circumstances! We are still facing challenges on a few different fronts yet we keep going! 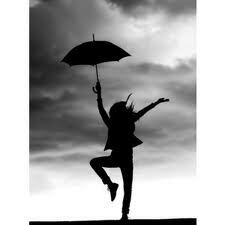 Life will never be the same - we are learning to dance in the rain over and over again- even if at times the dancing is a bit shakey!! It is still funny though how you can be feeling refreshed one day and then weary the next. Well I am still amazed at our ability to go on - haha we were saying this craziness has become our new norm!! So just keep swimming, just keep swimming remains our theme song. Yabadabadoo - bye bye chemo bye bye!!!!!!!! Radiotherapy on the horizon ! !